It is a bit late to be sharing these two books, but I wanted to be sure that people knew of them for this week before the election and for the future. This book is twenty years old, donated to my used bookstore. 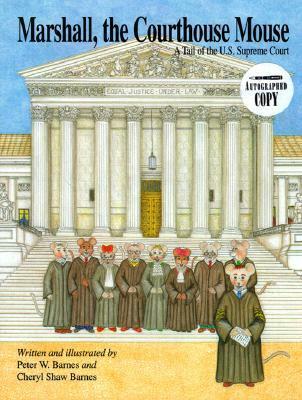 It doesn't surpass all the RBG books out for older students, but if you want a book that thoroughly offers the background history and the way courts, especially the Supreme Court, works in an accessible way for young children, it is a good one. Told in verse with fun examples like the case considered that all mice must eat a different cheese every day, against freedom of choice! There is an extra historical note at the back for parents and teachers with more detailed information. My students had the good fortune to sit in on a session with our state supreme court, examining a case, then making our own decision later, and returning to hear the court's final decision. If you have older students and are able to do this, it is a marvelous experience. 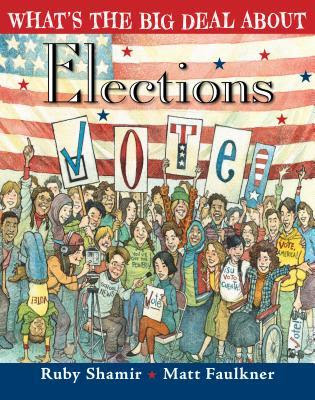 This book is a beautiful one for election prep. 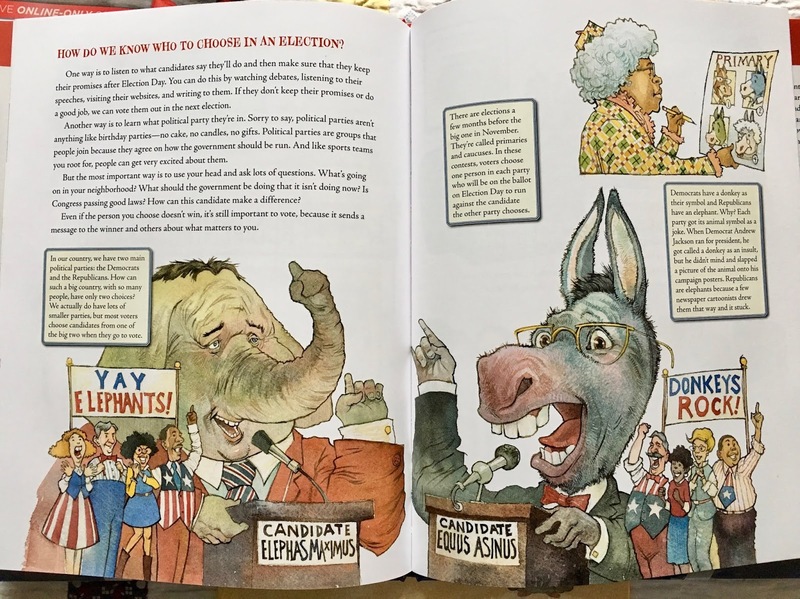 Each double-page spread answers one question like "How do we know who to choose in an election?" where it explains the two-party system, how the Republicans and Democrats got their mascots, and the importance of asking lots of questions before choosing. 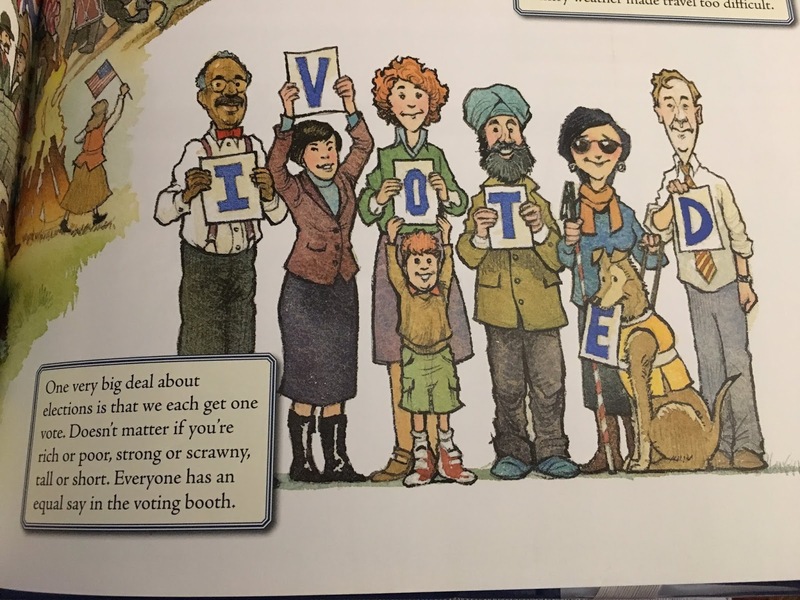 There is diversity included in the illustrations and extra boxes of information along the way. Colorful art that seems to have red, white and blue dominating the pictures. They are cartoon-like exaggerations sometimes, quite entertaining as they accompany the explanations. It flows well, tells just enough to inform about each topic. A favorite part of a page! The back matter includes a timeline and sources for additional reading. 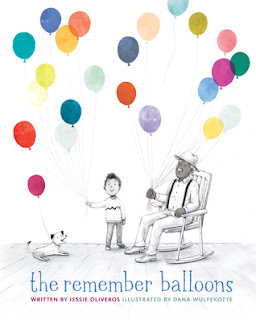 I have held onto this second book, The Remember Balloons for a while. 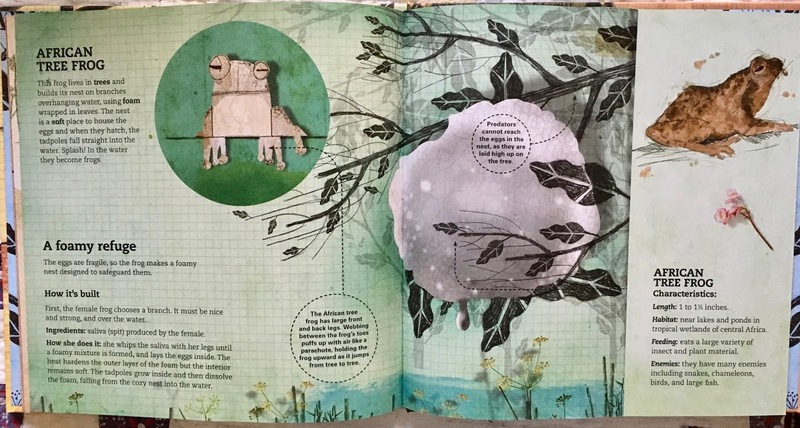 My husband passed away from Parkinson's with its own kind of dementia, and it wasn't a book I was really wanting to read, though I know it is good to have a picture book to help open the topic for children, to help them understand. 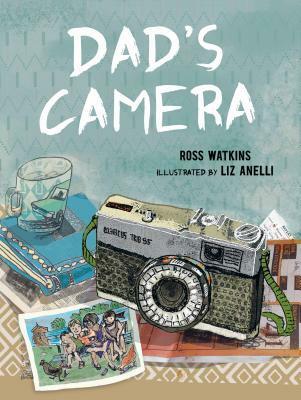 Then, Candlewick sent me this first book, Dad's Camera, and I didn't know that it, too, was about Alzheimer's Disease. Both are good reminders that dementia can take different forms and be explained sweetly to children who may need to understand a family member. Each person with a disease that attacks the memory is different, as is this father in this moving picture book, an emotional look at a family touched by Alzheimer’s. Dad keeps taking photos with an old camera he has found. The snapshots are meant to celebrate his memories and his life, so his family has something to remember him by. However, they don't understand why he is taking photos of strange things, like his keys, his coffee cup, the objects scattered on his desk. He starts doing a lot of things that are hard to understand, like putting items that belong in the fridge in the cupboard and ones that belong in the cupboard in the fridge. At the end, they do realize that he loved them very much. First published in Australia. 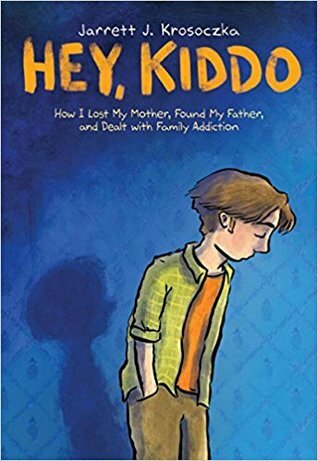 Jessie Oliveros does a terrific job of telling about Alzheimer's Disease in an easy-to-understand way for young readers. She uses the analogy of balloons as memories and at first the boy telling the story shares he has way more "balloons" than his little brother. His favorite is the one filled with his last birthday party. His mom and dad have more than he does, but his grandpa has more than all of them together, with marvelous stories. As the story moves along, Grandpa sometimes tells about one balloon twice, and then he begins to forget those stories. They simply float away. The boy is shattered, but his parents help him realize that now Grandpa's balloons belong to him that he can share. Dana Wulfekotte illustrates the story with a limited palette except for those beautiful memory balloons. 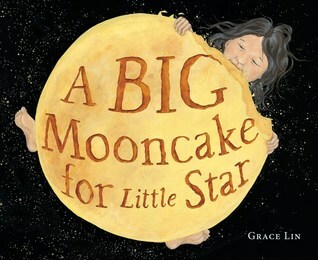 It's a week after the full moon, a delightful time to read this beautiful story, a folktale, of a mother making huge mooncakes, making sure her daughter knows that she is not to take any bites of it. That daughter's name is Little Star. However, in the night, Little Star wakes to look up and see how tasty that cake looks. Perhaps she can have just a nibble? 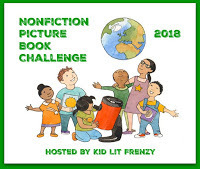 With black sky background, Little Star dressed in pajamas covered with stars, and that beautiful, glowing, delicious-looking Mooncake filling up the pages, bit by bite the reader sees the moon's monthly journey across the sky. I adore the little details, like the crumbs on Little Star's face after her first bite. And the endpapers include the cooking scene with a boxed mix titled Leo and a small splash of spilled milk turns into spiral one sees in outer space. It's a magical book. 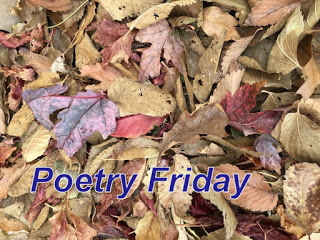 Kay McGriff at A Journey Through The Pages hosts this final Poetry Friday in October with a view of her own sunrise inspiration. Thanks, Kay! I'm visiting Irene Latham at Live Your Poem today with an "Octopoem" for Agnes, her favorite octopus, celebrating #Octopusmonth. My days filled with leaves this week, alongside the challenging news, daily things like checking for a roof leak (no answer to the ceiling crack yet-yikes), and fun, too, with the grandgirls and at the bookstore. I raked them. I filled paper bags from Ace Hardware and delivered them to our "Leaf Drop" program for future mulch. I gathered some beautiful ones to lay on the dining table and show Ingrid and Imogene how to identify them. 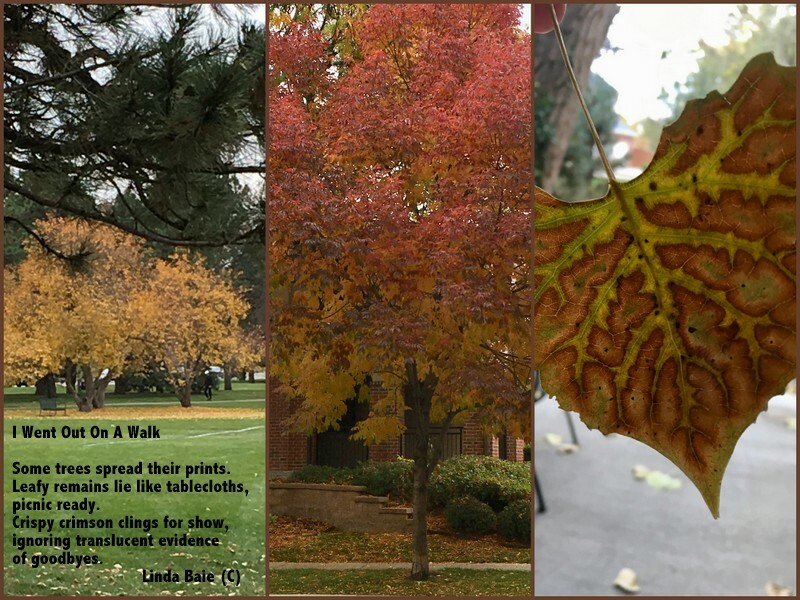 And, sharing below, I took a walk. Actually, I took more than one, but. . . I am fortunate to live where there are many trees, a forest city! So, a poem, too. Some trees spread their prints. 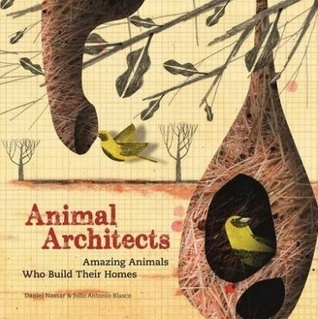 Thirteen animals are explored in this wonderful book first published in Spain about how animals build their homes and the interesting, and needed, approach each chooses in that construction. With marvelous mixed-media illustrations by Julio Antonio Blasco, Daniel Nassar shares much information about each, like where and why the home type, how it's built, and special characteristics of the animals that aid the construction. Each page has a unique fold-out that mimics a "plan" with materials listed and the actual project drawn on graph paper. (see example below). An example of a full double-page spread. What is seen when you lift the flap on the right in the page shown above. From insects like termites to birds like the bower bird and including mammals like chimpanzees, it's a wide array of architectural masterpieces explained. I loved the way the home site of each animal is cleverly added to the pages, like those above with the African tree frog's home nestled high in a tree to protect against predators, but over water so when the eggs hatch, those little tadpoles fall into the water. This book will be a great beginning to a classroom study of "homes" or part of a study of "animals". It's terrific. 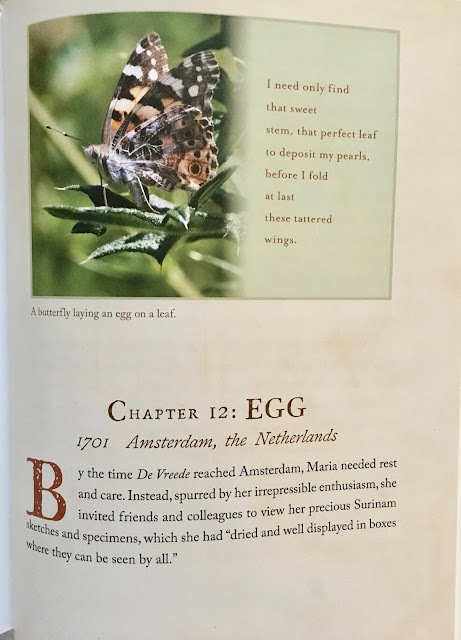 And it will make a great pairing with A House In The Sky: And Other Uncommon Animal Homes by Steve Jenkins and Robin Gourley. See Alyson's post above for its new honor. The last time I posted, I shared this book by M.T. Anderson and Eugene Yelchin. 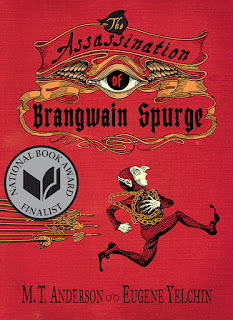 Now I want to congratulate them for being chosen for as a finalist for the National Book Award! See that new shiny sticker! 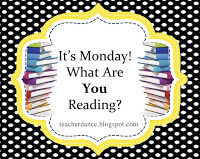 I've been visiting my son and family out of town, so read very little while there, but have tried to catch up this past weekend and want to share a variety of books! Yes, finally I understand why all the raving about this story. It is a beautiful read, one I had to put down for my trip away, and raced through last Thursday. There are alternating time settings, a lot of puzzles, especially brilliant that while Candice and Brandon are working out the biggest puzzle, we readers are also tested in solving Varian Johnson's puzzle challenge to us. 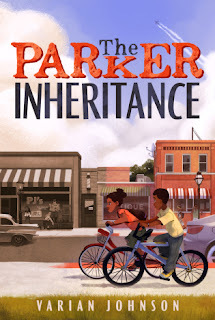 I enjoyed adding each piece, trying a shape in one place or in another, right along with those two young kids whose friendship grows through some ups and downs, and ends with an honest partnership. There are pieces that might surprise, but ones that will show other kids how life can work out just fine through some honest talk between friends, between kids and parents, and between other kids and other adults (if only they would listen to each other). Don't miss this if you have put it off a while as I did! Hey, Kiddo is the graphic memoir of author-illustrator Jarrett J. Krosoczka. You may know his Ted talk in which he shares this story, but now, in a limited palette that fits his life, it becomes something to love despite the darkness, to admire because of the goodness that he also showed. Unsparing love from all his family, including his heroin-addicted mother whom he only wishes he could be with, and finally just be with a little bit more because full-time was never possible. They didn't count on raising another child, but his grandparents took him, ensured he was as safe as they could make him. Even in the lowest points, they supported and encouraged him. From his beginnings, I felt the underlying sadness throughout but the celebrations happened, too. Jarrett showed in examples throughout that his art passion truly became his "saving grace". Perhaps there are others who have not been touched by drug abuse and sorrow because of it, but my family has. 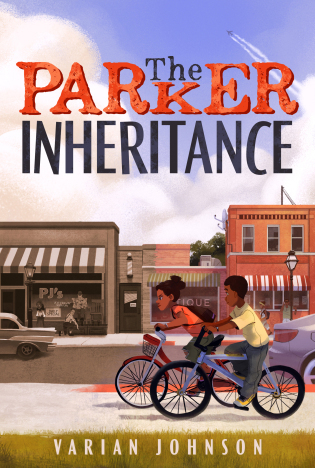 This memoir feels like a kind of hand-holding, something young adults can hold onto with hope in Jarrett's story as inspiration. You can hear Terry Gross interview Jarrett on NPR here! Just by chance, I was listening while out on errands this week. It was nice to hear his voice again. 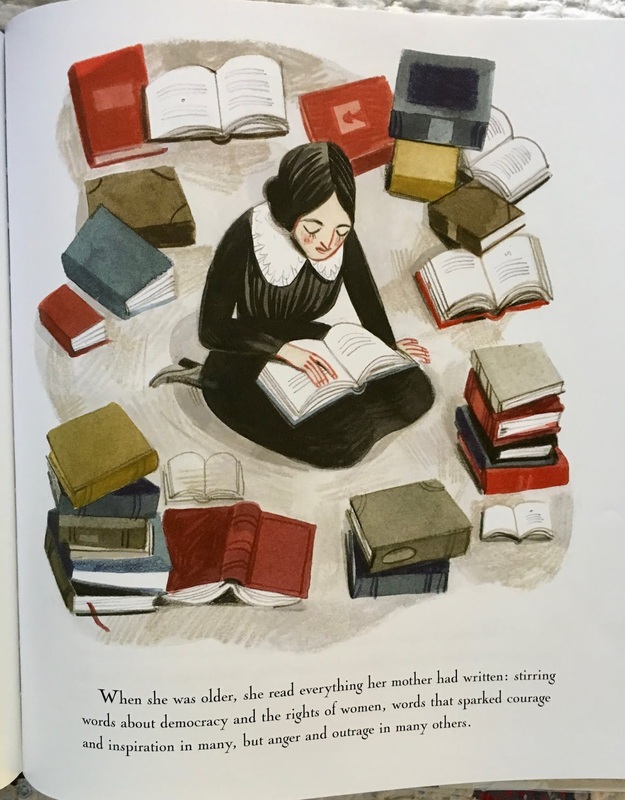 I've also had the joy of receiving some special books from Candlewick, some that may be the right gift for a special person or class in your life. 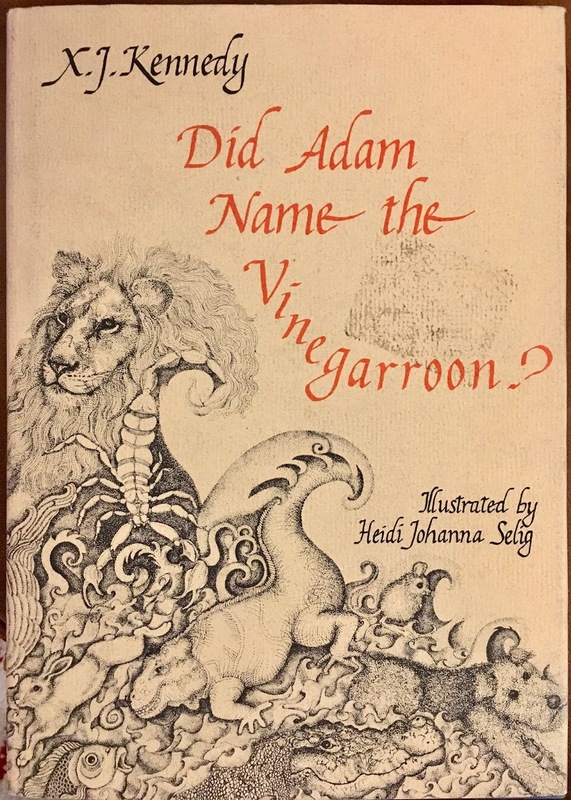 Recently published in the U.S., Ingela P Arrhenius (remember her giant animal book!) 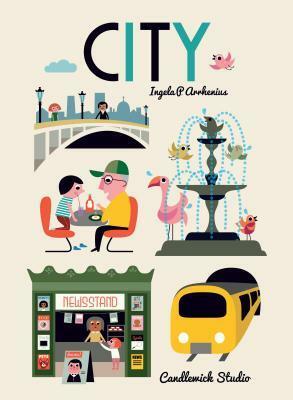 has created another over-sized book all about cities. In City, she highlights all the wonders one can find, perhaps not in every city, like subways, but most pages are filled with familiar sights. There are things, like newsstands and airports and construction sites, filled with all kinds of people enjoying those places. 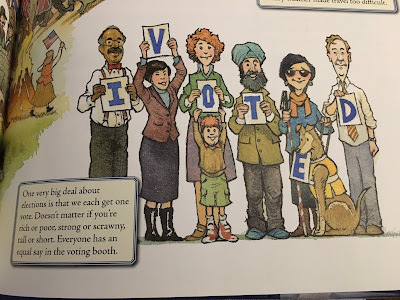 She also included people in their own pages, like mail carriers and skateboarders! 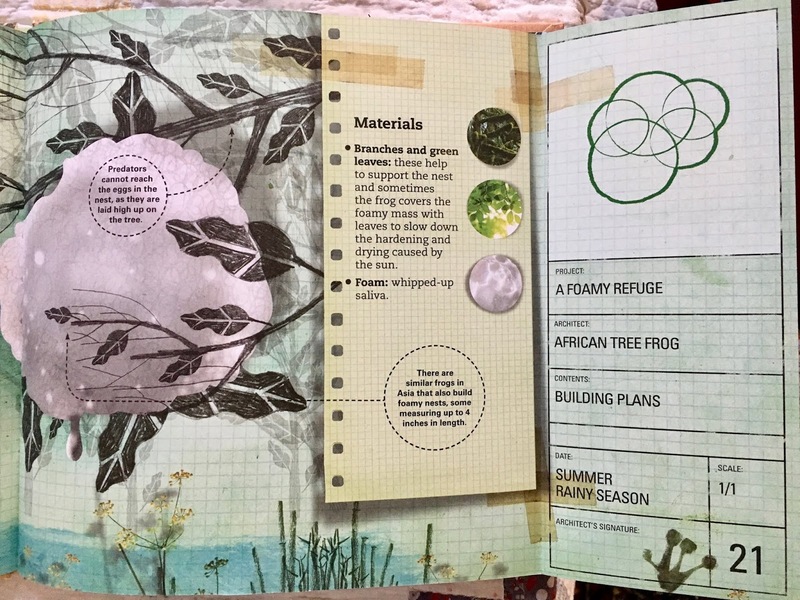 Graphic images make these city parts come alive and the endpapers also are full of smaller "city" discoveries: people like construction workers, soccer players, and vendors; things like clocks, cranes, and onions! I know that classrooms often have a yearlong theme, like Cities, to study. This is the perfect book to underpin discovering all that a city can be. Brenda Harsham at Friendly Fairy Tales hosts Poetry Friday today with a sweet gathering haiku to lift our spirits. I missed Michelle Barnes' post last week with Today's Little Ditty's latest challenge, this time from Calef Brown. Briefly, he asked poets to "Write a poem or a story about two anthropomorphized objects. They can be an odd couple, close friends, mortal enemies, or meet each other for the first time. 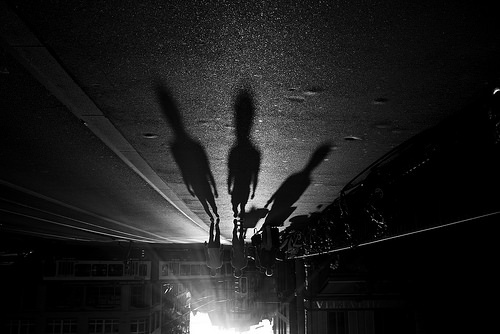 The poem or story can be about an adventure they have together, a conflict, a game they play, anything." I have been intrigued by this, enjoying the poems on the padlet so far, and wrote one and posted it. But I have had a question in the back of my mind for months that I read somewhere: "Can afraid and brave learn to get along?" I've written more than one poem this year about perspective, something that appears so challenging this politically-charged year. Thus I began a second approach to this challenge. Can I find an answer by writing? What do you think? Did I? they too heard scratching in the wall. It often queries, “Whence that smell? Afraid does not turn out the light. like artist’s drawings in a dream. the bells that ring, a person’s sneeze. Brave’s lamp turned off, it rests instead. a simple act that plants a seed. 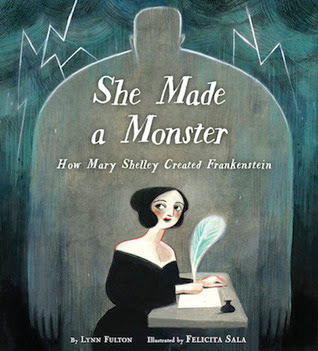 It's the bicentennial of Frankenstein and nearing Halloween, so it's a great time to share this story of Mary Shelley on the night she created a most frightening monster. 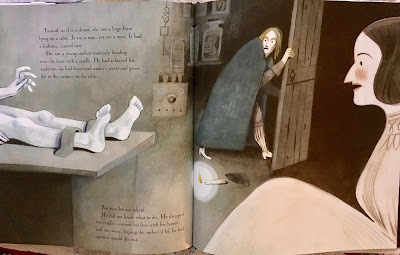 Telling of a young woman who sits in a dark house and dreams of her life as a writer shows this one night when the idea of Mary's monster begins. She wants to be a writer like her mother, Mary Wollstonecraft, who passed away when Mary was very young, but the ideas just did not appear. The poet Lord Byron and her good friend, soon to be husband, Percy Shelley, among others, were visiting and Byron set forth a challenge to them to write a ghost story. Mary wanted to write, wanted an idea, and with only one day left, still nothing. Frustrated and anxious, she went to bed. As she drifted off to sleep, she dreamed of a man that was not a man. He was a monster. Everyone knows Frankenstein, but few know the beginnings of this story, one where Mary created this man, one not as scary as others show, but lonely and ostracized. It can be an entry to the reading of the book for older middle and high schoolers. 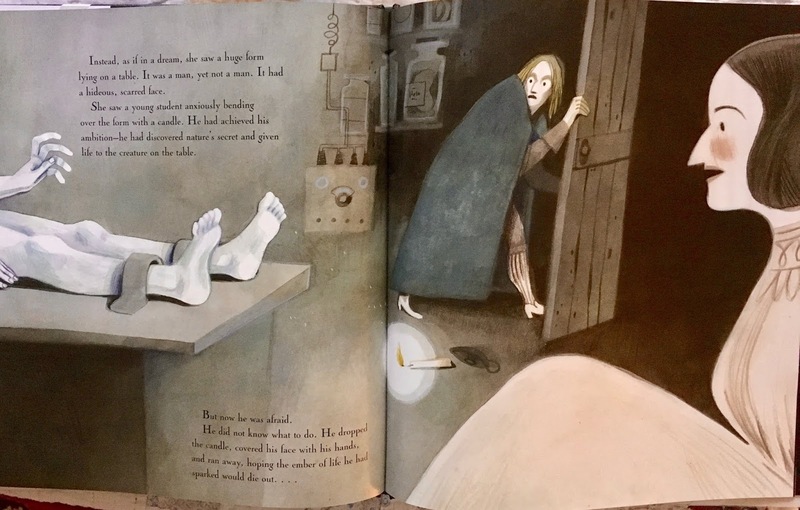 Felicita Sala illustrates the book in dark and dreamy gray tones, surely the atmosphere of that evening when the group spoke of vampires and ghosts, their stories already written, and the night Mary had a dream. There is an author's note where Lynn Fulton explains the changes she made that are not supported in the sources. 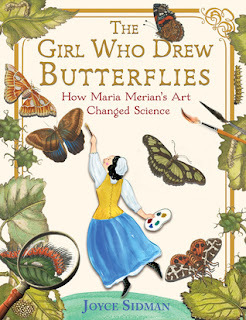 I had the pleasure of an advanced copy from Candlewick Press for this book by M.T. Anderson and Eugene Yelchin. Eugene Yelchin illustrates the elf side of this story. 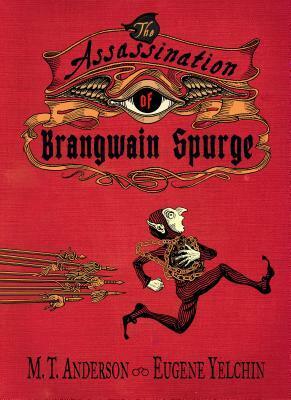 In pen and ink archaic style, a few of his chapters move the plot along, enabling us to see the world-building and action from Brangwain's point of view, as the "other", Werfel's story is told in prose by Anderson. 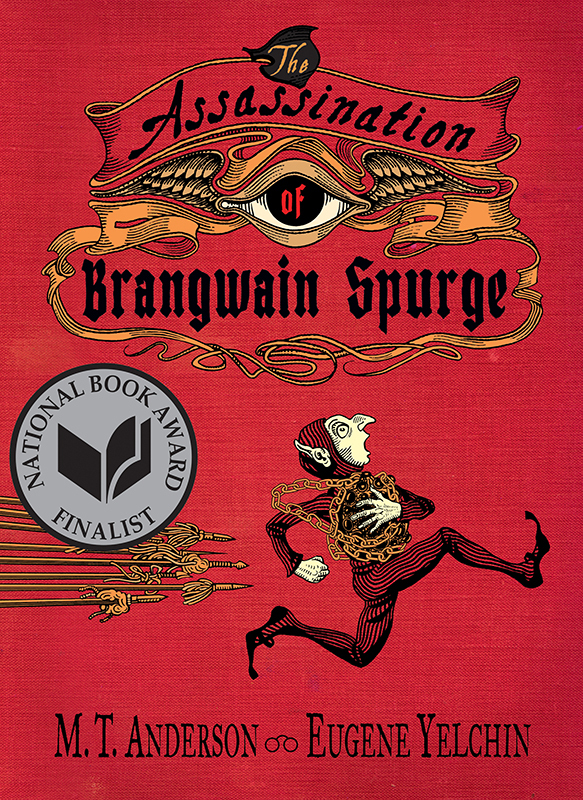 The reader will be thrilled to see and read the details of this new place, home of Goblins, and the fantastical plot that moves like a speeding train, across landscapes hard to imagine unless one is M.T. Anderson or Eugene Yelchin. 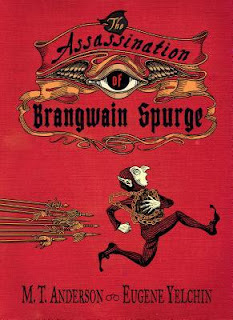 To meet Brangwain Spurge and Werfel, both earnest and honest creatures that just happen to come from very different worlds, and histories, is a pleasure. And, thanks to Beaming Books, I received a copy of this new book celebrating fall and the joys of friendship and sharing. 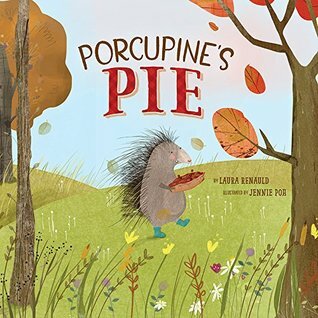 This sweet story by Laura Renauld--out tomorrow--is the winner of the Beaming Books picture book writing contest! Porcupine prepares for Fall Feast Day by taking off for the river to wash her cranberries. On the way, she meets several animals like Squirrel and asks them if they are preparing the favorite dishes she remembers from last year. Squirrel replies no, no "Nut Bread" this year because she has no flour. Generous Porcupine is happy to share her flour and tells squirrel to help herself. There is humor as well as sharing, like when Bear, appreciative that he will get the needed butter for his "Famous Honey Cake", "nearly hugs Porcupine". As Porcupine moves along, young readers might also notice that those cranberries are spilling from the bucket. Oh no! But Porcupine doesn't realize what's happening and is so disappointed at the river. She trudges home, saying later to the guests that there will only be piecrust this time. All working and sharing together makes a delicious end with "Friendship Pie". The recipe is at the back! Jennie Poh's illustrations fill the pages with cute animals in an autumnal forest, a rich anthropomorphizing in this story, with small touches like Porcupine's cupboard with dishes, a hanging picture of a cupcake, and Bear hanging out with a book. There is also a ladybug that makes an appearance in every scene. It is a story for young readers, perhaps with an added sharing and cooking time? Tabatha Yeatts at The Opposite of Indifference hosts Poetry Friday today with a bit of a leaning toward German and Germany. You'll see! Tausend Dank, Tabatha! And be sure to visit Irene Latham's blog, Live Your Poem, to join her in her celebration of Octopus Month. Again, you'll discover more when you visit. I've enjoyed X.J. 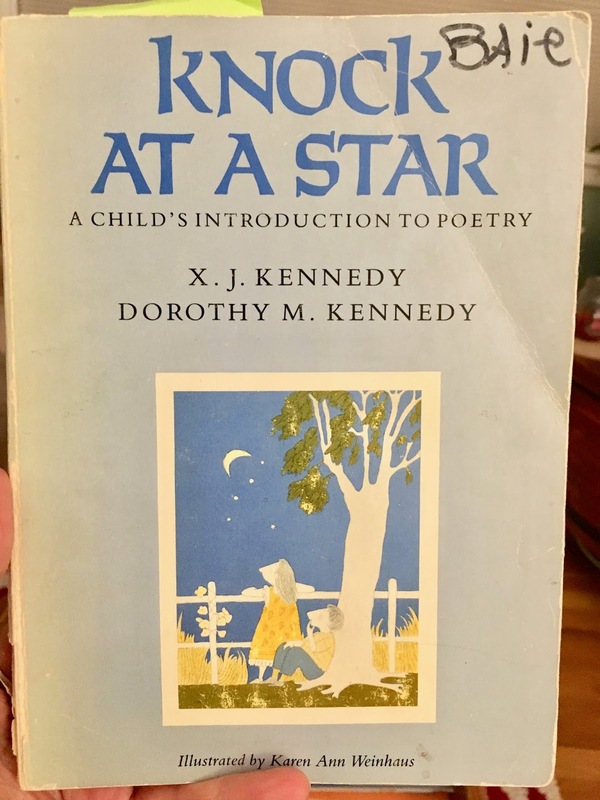 Kennedy's books for a long time, and mostly the one written with his wife, Dorothy M. Kennedy, Knock At A Star - A Child's Introduction to Poetry. This is one edition I have, falling apart, but it is still in print with a new cover. For those new teachers I mentored, this is the book I gave them to start them on their way to sharing poetry with students. Of course, others are favorites, too, yet I still love this one. 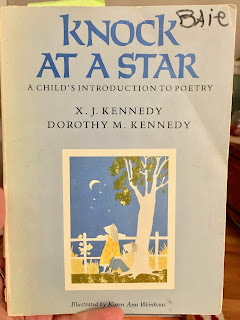 When a poetry collection was donated to the bookstore by X.J. Kennedy, I snapped it up and would love to share it with you. It is a bestiary alphabet book, full of animals known (bee, quetzal, snail), animals created (Ursa Major & Ursa Minor, minotaur), animals ancient (tyrannosaur), and animals real, but unknown to some, including me (Pangolin). Have you ever heard of a "Vinegarroon"? Pencil illustrations by Heidi Johanna Selig help visualize the descriptions by Kennedy, often with great humor. Here is one page with the poem "Alligator" and her illustration. 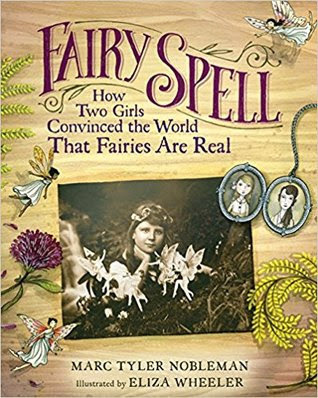 It's the true story of British cousins who fooled the world for more than 60 years with a remarkable hoax, photographs of “real” fairies. There are the photos (see the cover) and there is the time toward the end of World War I when most had no idea how a camera worked or how to use one. Elsie and Frances Griffiths (cousins) tell their parents they saw fairies near their cottage, down near the stream where they often sat, played, and dreamed. Frances and her mother lived with Aunt Polly and Uncle Arthur and cousin Elsie because their father was serving in the war. They insisted if only Uncle Arthur would allow them to use his camera, they could prove it. When he gave them permission, they finally got the (rather convincing, but faked) photo to prove it. Elsie's father dismissed them as "stories", but the mother (Polly) thought Elise and Frances were telling the truth. The hoax was a mild success, but blew up when Polly showed them to Edward Gardner, who put them in the hands of Arthur Conan Doyle who made the photos famous, running them in the popular Strand magazine.